The Ayres of Edge Hill | slate river ramblings . . . .
Today, the house at what was once Edge Hill, located on Buckingham’s Slate River, is gone; yet, each spring, the Ayres cemetery blooms, profuse with periwinkle. Once the home of Rev. John Ayres, eventually, Edge Hill was occupied by his son, Matthias Leake Ayers (1813–1853), and his wife, Martha Rebecca Hanes (1825–1855), of Humanity Hall, which lays adjacent Edge Hill, just across the river. There, in 1848, Elijah Hanes established Humanity Hall Academy. Two of Matthias and Martha Ayres’ sons, both educators, were buried at Edge Hill. 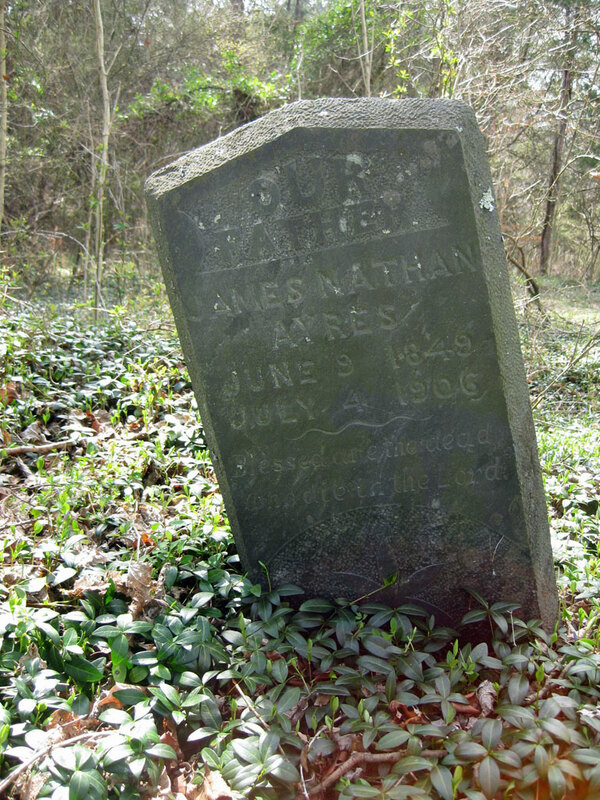 Prior to 1890, James Nathan Ayres (1849-1906), whose grave is pictured above, was employed teaching school in Buckingham County. According to Harry S. Holman, “Cousin Jimmy taught Latin.” In 1893, he was the principal teacher at Well Water School; Miss Hannah Winfrey was the assistant teacher. Jimmy’s older brother, Thomas Eldridge Ayres (1847–1874), was educated at the University of Virginia (1868-1870) and married Olivia Winfield Blackwell (born c. 1847). Olivia was the daughter of Rev. John Blackwell, President of Buckingham Female Collegiate Institute. Later, Thomas taught mathematics in Baltimore, Maryland. There is no question that this extended Ayres-Hanes-Blackwell family of educators, living on Slate River, positively influenced generations in Buckingham County and beyond. I am searching for the parents of Elizabeth Benecia Ayers 1774 who married Martin Chastain 1768. They lived in Buckingham Co. VA. Any help is most appreciated. One of my great grandfathers, several times removed, William Newton, Sr; who is said to have been born in 1767 and died about 1814, was buried in a small cemetery with the Ayres family in Buckingham county. Does anyone know of the location of this cemetery? Joanne, thank you for the reply. I’m not sure if the Ayres cemetery is the correct one or not. If he was buried in this one, I would venture to guess there would be no headstone other than maybe a field stone or piece of slate to mark his grave. My dad Charles L Newton, Jr is buried in the Scottsville Cemetery and his parents Charles L Newton Sr and Virginia Helen Thomas Newton are buried in the Newton family cemetery on Bridgeport Rd. Danny, Doubtless there are several unmarked and unnamed graves in the cemetery at Edge Hill as there are all over Buckingham County. Also, like many that have “gone to the woods,” the cemetery at Edge Hill is not very accessible. Rev. John Ayers officiated at the marriage of my fourth great-grandfather, William P. Shepherd and Martha Gaines Booker, dau of Bernard Gaines Booker. They were married on 26 May 1830. This was printed in the Richmond papers on 6 June of that year. I haven’t been able to trace the Shepherds back beyond him. He appears out of nowhere in the early 1800s and I can’t fit him in with any of the other Shepherds/Shepards. Frustrating. Kimberly, Thanks for the information about the Shepherd-Booker marriage. Watch for posts, coming soon, about Rev. John Ayres and the Booker family. I am working on a new book which includes the Ayres family. I would love to add your line if you would be so glad to send it. Both of my paternal grandparents descend from Jane Ayres Holman–daughter of Col. Nathan Ayres. Grandma Holman also descended from Judith Ayres Spencer–eldest child of Col. Nathan Ayres. He was the father of Rev. John Ayres of “Edge Hill,” Buckingham County–mentioned in Coz. Joanne’s account. Harry, We all look forward to your next book! Enjoy so much the history shared in these stories. Thank you, Joanne, for your time and effort. Janet, As far as I know, all Ayres in Buckingham County are related. It is just a question of how!